Watch the video linked below. This is a documentary about the Columbia River basalt. There is a youtube link, as well as an mp4 download link. Watch the video and consider the different aspects of the Columbia River Basalt Group eruptions. Think about the igneous processes presented in Chapter 5 of your text book. (5 pts) After you watch the videos, submit a discussion “Thread.” There is an instructional pdf that I provide on the web page for this Online Activity to help one remember how to submit a discussion “Thread” and then later to submit a comment “Post.” Here is a link to that document. Write about three important facts that you learned from the video. The deadline to submit a discussion thread is 5/01/2015 at midnight. (5 pts) Select two discussion threads (from your fellow students) to read. Read those discussion threads and make a constructive comment using a “Post” to one of the threads. The deadline to make a comment is 5/04/2015 at 2 PM. 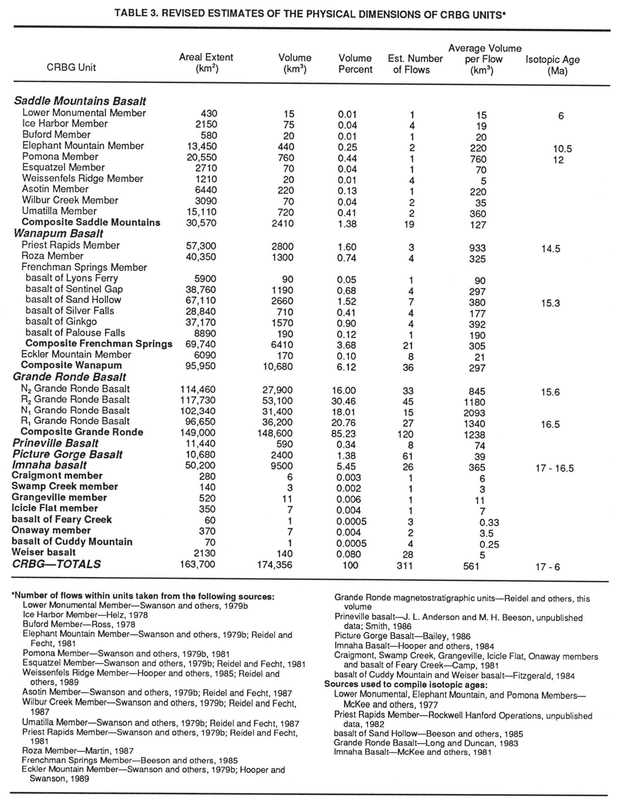 (10 pts) The table below lists the areal extent (km2), the volume (km3), the volume percent (the percent that the flow comprises of the total of all the CRB volume), the estimated number of flows, the average volume per flow (km3), and the Isotopic Age (Ma; based upon radioactive half-lives) for the Columbia River Basalt Group Units. I provide two grids for you to plot these data upon. One is a linear-linear plot (both the horizontal and vertical scales are linear scales) and one is a log-linear plot (the horizontal scale is linear and the vertical scale is logarithmic). Print out the grid sheets. We will be plotting only the CRBGs that have age data in the table. This table is also found in the Activity 4 pdf linked below. (2.5 pts) Use the linear-linear grid. Plot the Volume (km3) on the vertical axis and the Age (Ma) on the horizontal axis. Use points as your plotting style. Label the axes and label the points for which CRBG the point stands for. (2.5 pts) Use the log-linear grid. Plot the Volume (km3) on the vertical axis and the Age (Ma) on the horizontal axis. Use points as your plotting style. Label the axes and label the points for which CRBG the point represents. (5 pts) In the space given below the grids, discuss shortly the advantages and/or disadvantages of both the linear-linear and log-linear plots. Turn in these plots at our next class meeting. Here is the grid sheet to print out and turn in.